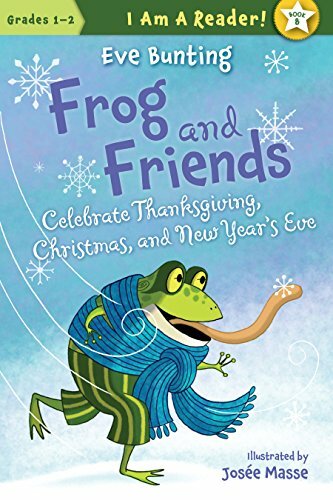 Author Eve Bunting’s new picture book, Frog and Friends Celebrate Thanksgiving, Christmas, and New Year’s Eve, will keep readers smiling from the beginning of the book to the very end. It may even keep them smiling all the way into the new year. It is the next installment of the Frog and Friends I Am A Reader series, and is comprised of three chapters: one for each major holiday of the season. Chapter One opens with Frog and friends preparing for a scrumptious Thanksgiving dinner of flies, caterpillars, mealworms, and ants. There is a sweet scene where they “hold paws and feet and claws” as they give thanks, and an even sweeter scene where they invite a hungry hedgehog on her way to her grandmother’s house to sit and eat with them. Hedgie is a little shy at first, and timid, too, because she’s sitting right next to a huge hippo named Hippo. But she soon understands that size doesn’t matter; it’s character—and friendship—that really counts. In Chapter Two, Frog and friends are curious about Christmas trees, and there’s no better person—or in this case, mouse—to educate them than someone who has been inside lots of houses. Little Jumping Mouse explains what a Christmas tree is and where you find one. Since Frog and friends don’t have a house (they only have a forest) Little Jumping Mouse helps them enjoy the trees that are right in their own back yard. Young readers will smile at the types of items the animals use to decorate the chosen tree, especially the clever “star” that goes on top. In the final chapter, Frog and friends are gearing up for New Year’s Day. But when they find out it means that the old year is over and everyone is expected to “change,” they’re not so sure they want to participate in it. This is a sweet chapter about love of the familiar and how difficult it can be to change. As always, Eve Bunting’s prose is sweet, clear, and peppered with humor. Artist Josee Masse captures the soft and cuddly spirit of young ones just learning what friendship is all about. All the animals have smiling, kid-friendly faces. Also, the variation in sizes (think tiny mouse versus humongous hippo) may well capture the way the world actually looks to small children; and their presentation and expert handling may calm some of the fears and misgivings that go along with dealing with the big things of the world. If there is any quibble at all, it is that in the chapter about New Year’s Day, the forest animals never face the fact that times do change . . . and so do we. They simply ignore New Year’s Day as if it didn’t happen. But other than this, it is a delightful book that any young child should be happy to add to a personal library.